About | Dino's Pizza is a restaurant based in Whiting, Indiana. 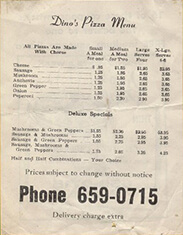 Dino’s Pizza opened it’s doors to the community of Whiting and Robertsdale in 1961. 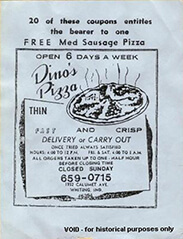 Formerly Baker Boys Pizza, Dino’s was originally located on 1932 Calumet Avenue. It is difficult to believe it was only carry out and delivery back then. Dino’s had a very limited menu too, strictly pizza. Our toppings included sausage, pepperoni, mushrooms, onions, green peppers, and anchovies. Over the past 52 years Dino’s Pizza has had five different owners. The previous owner picked the current home at 1601 121st Street. They added the lunch buffet and a few specialty pizzas. 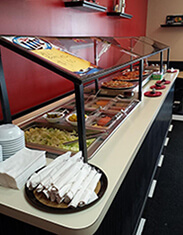 At the current location, we have dining available for 30 people. We have always been a family oriented business. We believe in serving the freshest product with the fastest, friendliest service available. We still make our dough and sauce, grind our own cheese and pork sausage, as well as chop our own vegetables daily.